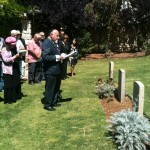 Address by Rabbi Raymond Apple at the 2013 ANZAC Day commemoration at the Jewish graves, Commonwealth War Cemetery, Mount Scopus, Jerusalem. In a reading prescribed for a week or two’s time, the Torah describes a census of the Israelite people that took place not so far from here. Moses was told to count the Israelite people letzivotam, “according to their armies” (Num. 1:1-3). They had battles ahead, but not as many as the tz’va’ot of the First World War – young men who went into the unknown almost a century ago. Some survived and eventually went home, others died and some are buried here. The age for service according to the Torah was 20-plus. Those whose remains lie in this soil were mostly round about that age and had the world ahead of them. Pir’kei Avot (5:21) says that 20 is the age lir’dof – which some understand as the age of maximum physical capacity, others as the age for seeking a livelihood. What civilisation lost with these young men was a concentration of identity, energy, enterprise, courage, vision and achievement. No-one can fully acknowledge the effect of their loss on their families and the lands they came from and were never able to return to. Just as only a week or so ago we mourned the loss of so many of Israel’s mostly young people during a struggle that is tragically not yet over. The Baal Shem Tov says there are three ways to mourn: to be silent, to weep, to laugh. We have to do all three at once. We are silent because we cannot say enough, and only wish that neither silence nor speech were necessary. We weep because of what they have lost – and what we have lost. We laugh, not because anything is funny (God forbid!) but because man’s spirit is indomitable. We are still here, the future still awaits, we hold the torch high. May their name be a blessing: may we in the years ahead bless their memory.